We’ve talked about how the jury process works and some of the reasons work is rejected. Of course, as Jamie Fingal pointed out in the comments, there are myriad factors that go into a works being accepted or rejected. No matter what – it’s a roll of the dice any time you enter a show. This is what the general public thinks of when you say “quilt.” A gymnasium somewhere with traditional quilts and grey haired “quilt police” counting stitches with a magnifying glass. Fortunately this stereotype. While accurate in some instances, it is in many cases a very wonderful place to show your artwork. Most quilt shows now have art categories but the judges don’t always come from an art background. 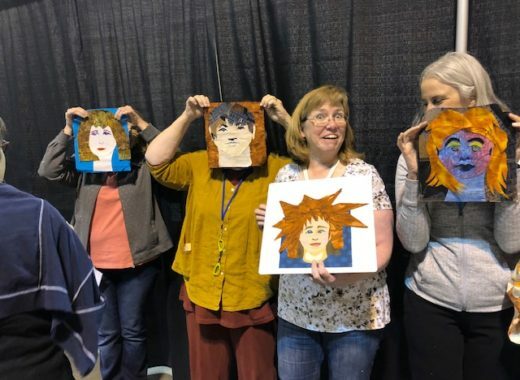 If you are making cutting edge art – think hard about why you are still entering a quilt show. I love traditional quilts and and greatly admire the mastery of technique that wins many a ribbon there. And I DO think that traditional quilts can be works of art in and of themselves. It’s one of the things I love about the quilt as a medium of expression. 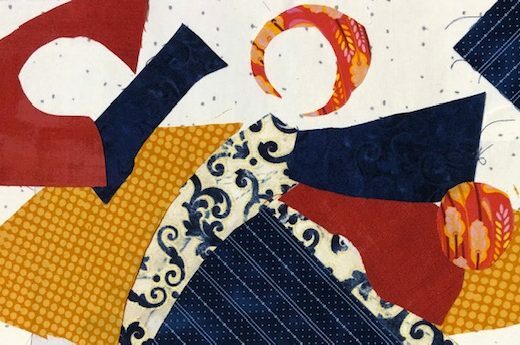 There is room for everyone at every level of creative expression in the quilt world. 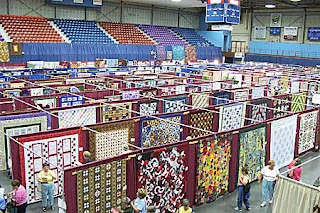 Many quilt shows offer the chance to be seen by a large number of people in a short time. If you want to teach quilters, it is great for them to be familiar with your work. Sometimes prize money is offered. In fact, sometimes, a LOT of prize money is offered. Most of the people that see your quilt are more interested in buying fabric than your artwork. There is rarely a mechanism set up for people to buy your work from a quilt show. Only a very few people actually win those cash prizes – but, hey, it could happen! Do your research. Does the show have art categories? How many people see it? Does it have a great reputation for treating the quilts with respect? Are you in it for the awards, for the visibility, to make sales, to sell patterns, to build a reputation as a quilt teacher? A show that is looking specifically for textiles but is hung and treated like a fine art show. The jurors are looking for original work, excellent composition and design. It is up to the curators how far into the innovative arena of textiles they want to venture. Some do not want work mounted in a hard frame, some require all the materials to be cloth rather than mixed media. Most are quite flexible in their requirements. These shows can often do a great deal to educate a broader audience about the media of textiles in the fine art world. Showing a group of quilts that were created intentionally as fine art gives them presence. 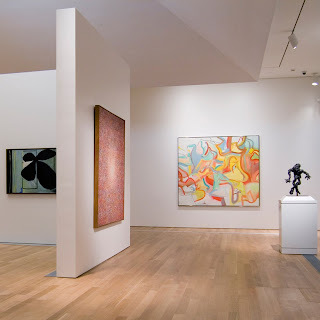 The works are hung on walls as art, rather than poles and pinned to drapes in a gymnasium. Your work will be treated as fine art. Period. I know that in my middle-to-small sized town, the art quilt shows we sponsor at the community galleries draw the biggest “crowds.” The organizers of the show will know how to manage your artwork – unpacking, hanging and handling should not be an issue here. I’m having a hard time thinking of any. Tell me some in the comments. Some of the venues don’t get a large viewership. Just as with any entry – do your research to see if your work fits. I maintain a list of these types of shows on my website – take a look. Ask yourself all the same questions, especially the “why am I doing this?” question. Are you in it for the awards, for the visibility, to make sales, to sell patterns, to build a reputation as a quilt teacher? Some fine art shows won’t even look at textiles. Some staffers or volunteers will be stymied when you ask for two nails in the wall rather than one to hang your work – even when you send in a clear and simple instructions pinned to the back of the work. The competition is tougher because your work will be more difficult to fit in among more traditional hangings of paintings and sculptures. I’ll say it again – do your research to see if your work fits. Ask yourself all the same questions, especially the “why am I doing this?” question. Are you in it for the awards, for the visibility, to make sales? Honestly ask yourself if your work will hold its own against high quality paintings. Consider mounting or framing smaller textiles to give them more “presence.” I have tutorials for mounting and framing small textiles here. Bottom line = do your homework. Ask yourself why you want to enter a show and then make your decisions accordingly. I’d love to hear your opinion! Hi Kyra – The one artist I know who has done this is Virginia Spiegel. Lyric, Thanks for the post. I wonder if the accessibility and affordability for print on demand will translate into more art quilters promoting their work in book form – e.g., via self-published catalogs of their work. Are you familiar with other art quilters taking this route? I'm grateful for some of the cash awards I've received. Otherwise, the show fees add up very fast, and I realistically don't know how much I would continue to spend. I now enter only certain shows throughout the year anyway. I continue to be grateful if my work is accepted and thus have the opportunity for some exposure. Ah – but Janice, I've tried hard to make the information easier to find! those are the art-quilt shows. 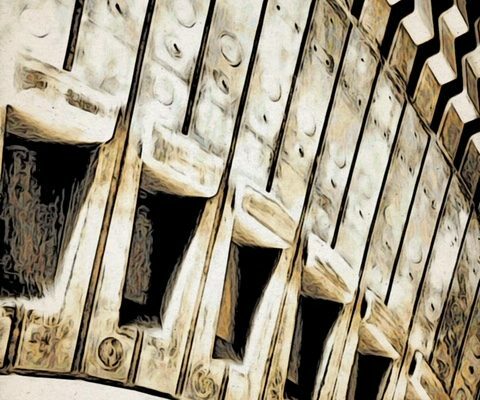 Art Calendar and many other places have long lists of fine art calls for entry. Great breakdown. Since most art quilters started as traditionalists we think of quilt shows with art categories. 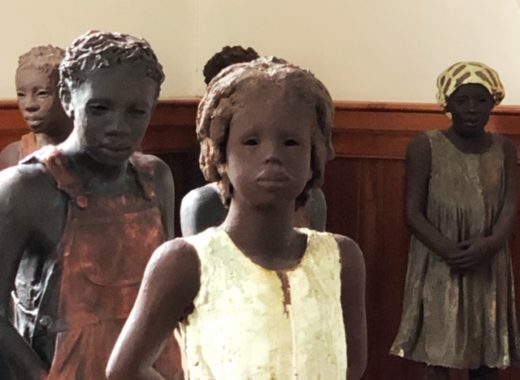 I loaned a piece to a museum for a themed 3 month long exhibit. Loved seeing my work in that setting so I'm hooked on anything other than a quilt show. Finding those exhibits is a battle, though. Robin – I feel so warm and happy! Thanks so much for the sunshine!!! Lynne – the "virgin quilt" rule is definitely one to watch out for. My pet peeve is the "expiration date" – as though art is no good any more once it is three years old. Ferret – do you make large work? If you make smaller work perhaps frame it or mount it on a stretched canvas and call it "mixed media" to fool them. Either way – I think it's good for our work to be seen, one way or another. I think part of my reason for entering is also the chance for a ribbon or prize. I LIKE getting a little "attagirl" now and then. Motherhood doesn't give you those very often. I have had no luck in London and the surrounding area suggesting that a quilt can be fine art. Art experts here insist textiles are not and cannot be fine art. If I want to show my work it has to be quilt shows, with all the problems that entails. However it does provide great advertising for all the quilting service I offer. I find competitions and shows offer a way to reach a broad audience very quickly, build your resume and meet other textile artists. I enter 2-3 competitions a year. This helps me focus my creativity and hone my skills. I am addicted to them and am always seeking out ones that fit my artistic medium. Some competitions *require* that the entry not be published or blogged. Make sure you know the specific rules before you enter. This is has been a discussion about convergence 2010 entries. When you enter, the competition has the rights to publish your submission images for their media relations. This can result in your entry *not* winning, but being published. Thus removing your entry from any further competitions. Beware of this! Only enter reputable shows and competitions. Check with other artists that entries are returned in a timely manner and that their artwork is not damaged. Its devastating to loose your creations due to a poorly managed event. Always always check. When sending your entries – insure your packages, require delivery signature and confirm their arrival. Thank you Lyric for all the information you share. I give to thee the Sunshine Award.